Click-&-Go™ Plus 594 Labeling Kit is a general purpose imaging kit that provides researchers everything required to perform the click reaction on alkyne tagged proteins with the red-fluorescent AFDye 594 Picolyl Azide (Alexa Fluor 594 Picolyl Azide equivalent) for subsequent downstream analysis. The kit utilizes a copper-chelating azide to raise the effective concentration of copper at the reaction site, which leads to dramatic acceleration of the rate of Cu(I)-catalyzed azide−alkyne cycloaddition (CuAAC) without the need to increase concentration of azide reagent and copper. Each kit includes sufficient material to perform least 30 cell or tissue assays based on a total reaction volume of 500 µL. Click-&-Go™ Plus 594 Labeling Kit is a general purpose, high sensitivity imaging kit that provides researchers everything required to perform the click reaction on alkyne tagged proteins with the blue-fluorescent AFDye 594 Picolyl Azide for subsequent downstream analysis. 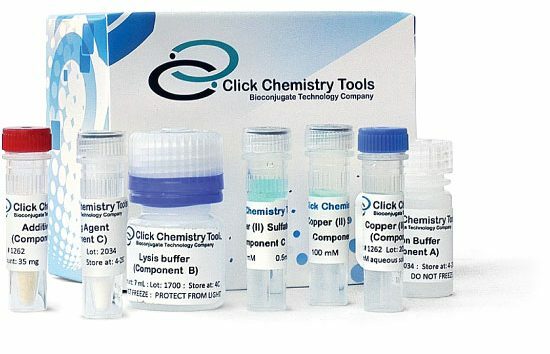 The kit utilizes an advanced fluorescent probe that incorporates a copper-chelating motif to raise the effective concentration of Cu(I) at the reaction site to dramatically improve the efficiency of the CuAAC reaction, resulting in a faster and more biocompatible CuAAC labeling (Figure 1). Up to 40-fold increase of signal intensity, compared to conventional azides, was reported (see Selected References). AFDye™ 594 (Alexa Fluor® 594 equivalent) is bright, water-soluble, and pH-insensitive from pH 4 to pH 10 red-fluorescent dye with absorption and emission maxima at 590 and 617 nm, respectively. It can be used with the 561 nm and 594 nm laser lines. AFDye™ 594 dye structurally is identical to Alexa Fluor® 594 sold by Thermo Fisher Scientific. Alexa Fluor® 594 is a registered trademark of Thermo Fisher Scientific.